The Seven of Swords represents craftiness, daring solutions, theft, dishonesty, disarming an opponent or impulsiveness. Often this card represents a far-fetched scheme or some kind of unorthodox solution which may or may not actually address the problem it is purporting to solve or avoid. It is an approach that is not straightforward, or which involves secrecy, trickery or deceit. Often this card implies a failed or sloppy attempt, or a “band-aid” which may in the short term alleviate some tension but which may in the long term worsen or complicate the underlying condition— mostly literally suggested by the fact that the man is not looking ahead where he is walking. This contorted stance also suggests diversion, as he directs attention away from his armfuls of stolen booty with his backward-turned expression, like a magician distracting you by one hand while he steals your watch with the other. 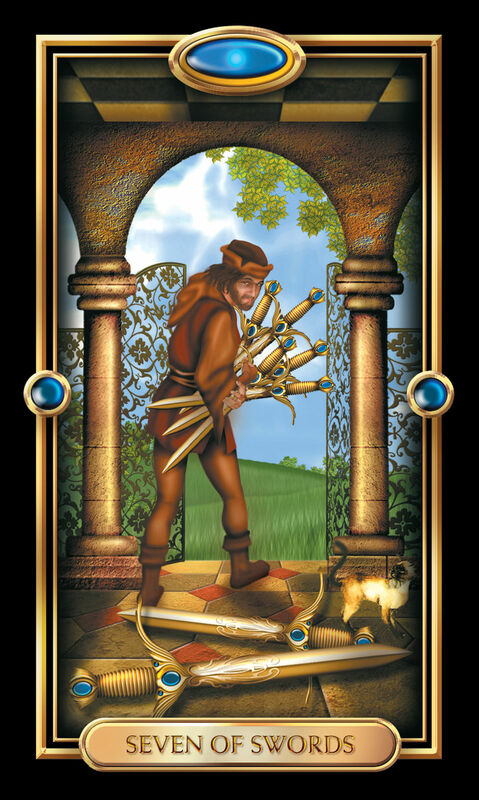 The man stealing the swords in the picture is acting alone, and sometimes this card may indicate having to carry an entire situation by yourself, or not being able to rally support or favor for your undertaking. The card can suggest hidden motives or goals, but it can also mean, in a somewhat more innocent interpretation, hiding our true feelings and maintaining a facade on the exterior. The power to conceal, misrepresent and contrive all belong to the Swords suit, for it is through words and thoughts that we are able to weave narratives, construct perspectives and affect how others perceive us. This card may indicate that we are hiding the truth of the situation behind a story, or keeping others at a safe distance through wit, cleverness, lies or out of a resistance to being emotionally vulnerable. It may indicate outright lying, “mishandling the facts”, or simply trying to gloss over a complicated or emotional situation with empty words. The Seven of Swords is connected to Mercury, as a symbol of cunning, deceit, dishonesty and insincerity. The Seven of Swords card can indicate that something in your life is moving forward in a less than honorable manner. You or someone in your life may be acting with dishonesty or trying to get out of a particular situation with lies. When the Seven of Swords card is reversed, it can represent clumsiness or forgetfulness in your life, especially with regard to remembering lies that have been told, and to whom. If you are sneaking around or cheating, you may soon lose track of all your lies and be exposed. If you have been feeling paranoid or afraid, despite doing nothing wrong, then you may soon be used as a scapegoat by someone else in your life, so choose your company with care. The Seven of Swords can indicate that you’re being watched closely at work by your boss. You may need to refocus and ensure that you are tending to your work in a timely manner and conducting yourself as is expected in your work place. Now is not a good time to get involved in work politics. If you are looking for work, it may be a good time to speak with people you know or have worked with in the past. The Seven of Swords card can represent a need for truth and trust in your love life. If you are in a committed relationship but feeling suspicious of your partner for some reason, now is a good time to have an honest conversation, even if it is difficult. If you are looking for love, you may meet someone interesting to you now, but you might be tempted to act as though you are not interested for some reason. Truth and honesty may be more attractive to your new suitor, so you may need to be engaging and charming rather than coy to keep the interest alive. The Seven of Swords can indicate that now is a good time to be cautious with your finances and avoid gambling or loaning others money. You may have some tough financial decisions coming up that will require you to rely on your integrity to protect your self-esteem and well-being. The Seven of Swords can be a warning about religious or spiritual gurus who will come into your life. If you encounter new spiritual leaders in your life who ask for money in exchange for enlightenment, you may need to proceed with caution or avoid them altogether. You may benefit more in your spiritual life by exploring on your own.